Freedom is never given but taken by the oppressed. Just like the kingdom of God suffering violence and only the violent can take it by force. It is said that the race to heaven is not an easy one because the road is very narrow, this we can say is also evident in our struggle for the restoration of Biafra. It was never easy for slaves in the 18th centuries to gain their freedom, though many tried and paid dearly for it; but never relented in their attempt which eventually paid off and brought an end to slave trade. When America fought Britian to gain freedom, lives were lost. To get away from Russia, Crimea fought Ukraine, Southern Sudan fought Sudan for many years to break away. Biafra had withstood Nigeria and her allies onslaught for eighteen months, in 1967-70. That unfinished war has been renewed in a new dispensation and with new dimension and precepts. It is evident that we are winning from all fronts that we are being attacked. Many factors and factions have come to play in this war, sabotage is ever far fetched, but in the end we always win. In any war, casualties occur, the innocent people suffer more in most cases. We have experienced all and will experience more, but only the resolute and will powered can survive and restore Biafra. Yet in all of these travails, IPOB is not daunted, her leadership is focused, steadfast, honest, ernest and transprent. We stand by our words and we are winning our battle. Drawing a graph to rate our efforts so far will give us a 70% score. It has been a bittersweet encounter, we have lost cherished Biafrans who have been forced to trascend for her sake. Many are languishing in various cells, others are injured or bedridden in hospitals; without shooting a single bullet, the Nigerian army is on the attack again, we are being drawn into intense warefare of life and death. Our leader, Mazi Nnamdi Kanu has been locked up in Nigerian prison since October 2015, without conviction at the dictate of the president. He is a prisoner of conscience for over a year now to the chagrin of a defeated law system. We may begin to ponder on the eforts and sacifices made so far. Without Biafra, we will remain slaves, working like an Elephant and feeding like an Ant. We will constantly be sacrificed to strange gods in name of religion. Our future will be bleak and poverty ridden. Our posterity will die naturally and our children's futures will extinguish hopelssly. Therefore, it is wise to fight on. The darker the night, the nearer the morning. Our foresight should be a blooming future in the land of our heritage. Weeping may endure for the night but our joy will definitely come in the morning. Many have fallen for this cause they believed in, many gallantly fought in 1967-70 and many more will keep fighting until our aim is achieved. 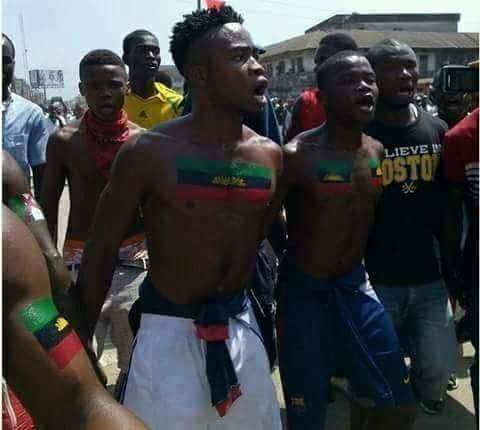 We must not lose faith in IPOB leadership, we have fustrated the Nigerian govenment and they have continued to fall into our traps as the world now knows how evil Nigeria is. They tried to convict and jail our leader Nnamdi Kanu, stop our Radio and Tv sations, stop our protests, impose media blackout on our agitation, brainwash many from supporting IPOB using their gutter media, in all of these we have not been overcomed. Rather we keep getting worldwide attention and recognition, and also support from prominent leaders and EU parliamentarians; many are acclimatizing with us. We are no longer facebook chatter box but now Buhari's worse nightmare. They approached us as Goliath, fully armed but in a place of uncertainties, the contraption is fizzling out. This is our time to bring Goliath Buhari down, our time to restore our dear nation Biafra. Arise oh Biafrans, for now is the time to take what is ours by force. Yes indeed, freedom is never given but taken by the oppressed. The world knows it and we are watching and waiting for the International community and global powers to do the needful before we run out patience.